Barbara Lebrun traces the evolution of 'protest' music in France since 1981, exploring the contradictions that emerge when artists who take their musical production and political commitment 'seriously', cross over to the mainstream, becoming profitable and consensual. Contestation is understood as a discourse shaped by the assumptions and practices of artists, producers, the media and audiences, for whom it makes sense to reject politically reactionary ideas and the dominant taste for commercial pop. Placing music in its economic, historical and ideological context, however, reveals the fragility and instability of these oppositions. The book firstly concentrates on music production in France, the relationships between independent labels, major companies and the state's cultural policies. This section provides the material background for understanding the development of rock alternatif, France's self-styled 'subversive' genre of the 1980s, and explains the specificity of a 'protest' music culture in late-twentieth-century France, in relation to the genre's tradition in the West. The second part looks at representations of a 'protest' identity in relation to discourses of national identity, focusing on two 1990s sub-genres. The first, chanson néo-réaliste, contests modernity through the use of acoustic instruments, but its nostalgic 'protest' raises questions about the artists' real engagement with the present. The second, rock métis, borrows from North African and Latino rhythms and challenges the 'neutral' Frenchness of the Republic, while advocating multiculturalism in problematic ways. A discussion of Manu Chao's career, a French artist who has achieved success abroad, also allows an exploration of the relationship between transnationalism and anti-globalization politics. 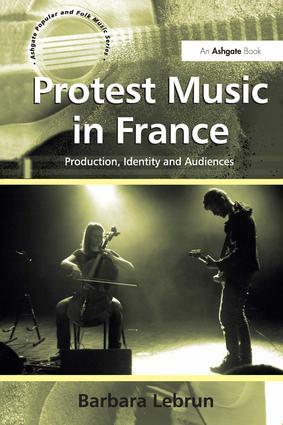 Finally, the book examines the audiences of French 'protest' music and considers festivals as places of 'non-mainstream' identity negotiation. Based on first-hand interviews, this section highlights the vocabulary of emotions that audiences use to make sense of an 'alternative' performance, unveiling the contradictions that underpin their self-definition as participants in a 'protest' culture. The book contributes to debates on the cultural production of 'resistance' and the representation of post-colonial identities, uncovering the social constructedness of the discourse of 'protest' in France. It pays attention to its nation-specific character while offering a wider reflection on the fluidity of 'subversive' identities, with potential applications across a range of Western music practices. Dr Barbara Lebrun is a lecturer in Contemporary French Culture at The University of Manchester, UK. She completed her PhD on 'alternative' French rock music in 2003, at the University of Southampton, and has published a number of articles on French popular music since, in both English and French.